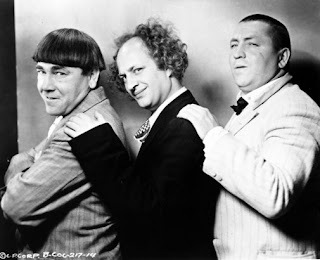 Last night Howard and I watched the Three Stooges doing "A Plumbing We Will Go." Remember how a while ago we talked about how to play the piano daily and stay sane? I think from now on we will watch a half hour of vaudeville comedy to stay sane. To keep things in perspective! I keep pushing Laurel and Hardy on Howard because that was my favorite comedy team, the way it was Leonard Pennario's. But Howard loves the Three Stooges. He said that when he was growing up they were practically family. And I have to say, I cracked up over the episode about them posing as plumbers. The ending will resonate with anyone from my part of the country. The Stooges are wrecking this poor guy's mansion. They have posed as plumbers to get away from the cops. Not to give everything away but they get the plumbing pipes and the electrical rigging mixed up. So you get this one scene when the cook looks up and sees the light bulb filling with water. "This house sure is messed up," he says. Then you get this tremendous scene where this woman is demonstrating a television. It is the early days of TV and everyone is sitting around formally, awaiting this demonstration. Ha, ha! There is nothing in these comedies like the sight of people sitting around formally. You know something is about to go terribly wrong! The TV shows pompous footage of Niagara Falls. You can tell where that is heading! Anyway, very funny, the Three Stooges, "A Plumbing We Will Go."